I made it through 7 books on vacation! That’s a lot for me. I crammed in reading the whole time I was gone, waking up early to read and spending a lot of time poolside. To me, 7 books is the sign of a successful vacation. 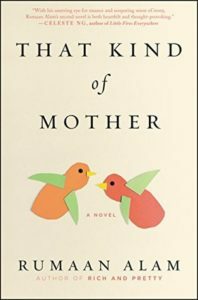 Vacation Read #1 was That Kind of Mother by Rumaan Alam. This is my August book club pick and one that I bought this spring (rare for me) before picking it up at Book Expo (of course!). Rebecca is a new mother living in Washington DC in the 80s. She has just had her first child, and breastfeeding is proving to be a challenge. Rescue takes the form of Priscilla, a lactation consultant working at the hospital to help new mothers. Priscilla’s calm presence and patient guidance helps Rebecca through the murky early days of motherhood, and when Rebecca decides she wants to hire a nanny to free up her days so that she can resume her writing career, she persuades Priscilla to quit her job and come work for her. The two women settle into an easy, comfortable relationship – almost a friendship, but a bit more complicated. Rebecca, white, is an open book. But Priscilla, African-American, always remains a bit of a mystery. When Priscilla – already the mother of a grown daughter, tells Rebecca that she’s pregnant, her employer is surprised but promises to make it work. And when Priscilla then dies in childbirth – having given birth right a few weeks before her own daughter has her first child – Rebecca decides takes the baby home and ultimately adopts him. That Kind of Mother is about parenthood and the many ways having children impacts lives and relationships. The author, himself the father of two adopted boys of a different race, explores what it’s like to be white and parent a black child. Rebecca has to contend with her feelings of sadness about Priscilla’s death, her loyalty to her husband, the competing needs of her two sons, and the responsibility she feels to Priscilla’s daughter and her family. Rebecca is unrealistically clueless about the realities of being black – and in particular a black man – and is shocked by the injustice she is warned that her son may experience. Overall, she means well and through her, Alam empathetically depicts the complexities of motherhood. But in the end she turns out to be pretty selfish and rather naive. And I am not sure that the underlying friendship between Priscilla and Rebecca is convincing enough to merit Rebecca’s commitment to Priscilla’s son. This was the first book I read on vacation and I am struggling to remember the details – not a great sign. It was a pleasant enough read but it left little impact on me. The treatment of race was pretty shallow in the end, and didn’t add much to what is currently a pretty robust debate. Maybe my book club discussion in a few weeks will awaken my memories, but for now this book was just OK for me. Posted on July 19, 2018 by gayle. This entry was posted in Fiction and tagged rumaan alam, that kind of mother. Bookmark the permalink. This was next on my list and I read the fair-to-middling reviews on Amazon and thought I might put it aside. Your review has cemented that. Back to the library it goes. Thanks!! Sorry it didn’t stick with you. Think I’ll pass on it. Looking at the list of other books you read on vacation, I can’t wait for the rest of your reviews — those are all books of interest to me! Yes, they were good picks!